The Hunter Valley, or also known as the Hunter region, is an area in New South Wales, Australia, approximately 100 kilometres (60 miles) north of Sydney. It is bordered by mountain ranges, all of which are part of the Hunter River system catchment. The Wattagan Mountains borders off the south and southeast, the Hunter Range borders the southwest and west, Liverpool Range to the northwest and to the north the Barrington Tops. The highest point in the Hunter is Brumlow Top (1586 metres), which is on the Barrington Tops, and the lowest point is sea level along the coast. The Upper Hunter (around Scone, Murrurundi and Merriwa) is undulating country while the lower Hunter (Maitland, Cessnock) is reasonably flat country and some of which lies in the flood plains of the Hunter, Paterson and Williams Rivers. 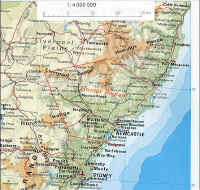 Heading towards the coastline, many areas are made up of vast wetlands, especially between Newcastle and Maitland. The coastline is made up of many sandy beaches and sand dunes. The Stockton Beach stretches almost 20 kilometres and is made up of the highest sand dunes in the Southern Hemisphere. The population of the region is approximately 600,000 (2004 estimate) and it includes the major towns and cities of Newcastle and Lake Macquarie (320,000), Maitland (60,000), Cessnock (40,000), Port Stephens Shire (60,000), Singleton (20,000), Muswellbrook (15,000) and Scone (4,000). Some of the other smaller centres include Dungog, Merriwa, Murrurundi, Denman and Gloucester. Much of the economy of the Hunter Region is based upon mining, light industry, steel production and agriculture. Newcastle is a major shipping port and is the worlds largest coal port. In recent years there has been a decline in steel production, however, tourism in the region has been rapidly increasing and Newcastle, being the sixth largest city in Australia, is now a major commercial centre for northern New South Wales.